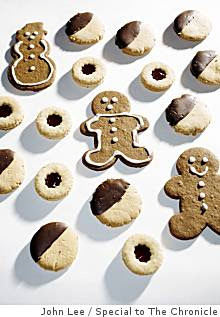 Am considering a cookie recipe printed in today's Chronicle food section which involves dipping baked cookies in chocolate melted with 1/2 T of shortening both to help the chocolate set and to prevent it from melting. Because of that, I presume that they don't mean butter. If you were employing this method, what shortening would you use? I would omit that addition because it is silly, and follow some other instructions for--instead--tempering chocolate. There are more and less simple ways to temper chocolate, depending on your level of patience. Tempered chocolate sets well, doesn't bloom (the whitish surfacing of coco butter), and is the proper thing to do with dipped things you want to be pretty. Adding shortening or butter would mess up the balance the chocolate maker has already established in cocoa/fat/sugar. In Ohio, people add paraffin wax to the chocolate that buckeye candies are dipped in. This is beyond silly and--rather than eating wax--Ohioans should learn to temper chocolate.